The following article was written by Naim Attallah who is the Chairman of Quartet Books, a leading independent publisher with a fine tradition of pursuing an alternative to the mainstream. Read the original article here. Last night tout Londres gathered at Daunt Books in the Fulham Road to celebrate Lucy O’Donnell, a formidable lady, and the launch of her book Cancer is My Teacher. The evening was emotionally charged as Lucy was in her element, looking bright and beautiful – and full of her usual zest for life. Here is the text of my short address on this moving occasion. Ladies and gentlemen, today marks a special launch of a remarkable book written by Lucy O’Donnell, one of the beautiful daughters of Lady Vanessa Hannam, the distinguished historical novelist whose last two books were published by Quartet. 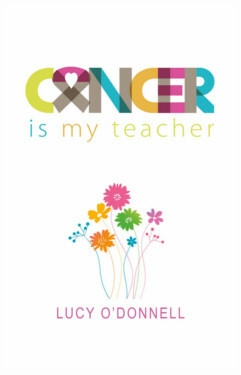 Cancer is My Teacher is a very moving account of the author’s struggle to stay alive, despite the ravages of an advanced cancer. We are therefore assembled here to celebrate Lucy’s tenacity and her fight against all the odds, never to give in, but to carry on as if nothing has happened to devastate her normal life. I first met Lucy about two years ago when I sat next to her at a dinner to mark the publication of one of her mother’s books and quite frankly was totally entranced by her energy, her joie de vivre and her natural capacity to make friends. Intelligent and determined, I found her to be a woman of many parts but always exuding a certain warmth that I would describe as her visiting card with some magic attached to it.